7:30 am – 5 :00 pm – Meet at Market and Sansome to plug into actions throughout the day marches to multiple sites – led by the Brass Liberation Orchestra!7:30 am, 9:00 am and 11:00am – Bikes Not Bombs – Bikers leave Justin Herman Plaza at to support the day’s actions. 11:00am – Words Against War, Market at Montgomery. City Lights Bookstore co-sponsors an anti-war read-out featuring Jack Hirschman, SF Poet Laureate; Guillermo Gómez-Peña, performance artist; Rebecca Solnit, author and activist; and MC James Kass of Youth Speaks. The National Lawyers Guild legal hotline for arrestees is 415-285-1011. View the Direct Action to Stop the War Legal website. Send a text to 40404 with the words “follow dasw” (case sensitive, no quotation marks). Standard rates apply. Catch live, from-the-street updates on your radio at 102.5 FM! On March 19, 2008 – the fifth anniversary of the U.S. invasion of Iraq – Direct Action to Stop the War will be organizing a day of decentralized, multiple-target direct action against government offices and war profiteers in downtown San Francisco. We have created a list (which is below) of San Francisco offices of federal agencies, corporations with military contracts or contracts in Iraq, politicians who have failed to stop the war, and foreign embassies of countries linked to the war in Iraq. We are focusing primarily on corporations with military or Iraqi contracts, because we want to focus attention on the prominent role played by war-profiteering corporations in the U.S. occupation of Iraq. We will take direct action on March 19th against as many of these locations as possible, in order to send a clear message to the economic and political elites that control this country: No business as usual until all U.S. troops are withdrawn from Iraq! Get together with a group of your friends and plan a direct action against a government or corporate office on March 19th. There are many, many other vital roles you can play in this action. Please come to our next organizing meeting and plug in. Take the day off work or school and meet up with us at Market & Sansome starting at 7:30am. Snake marches will be leaving Market & Sansome throughout the day, and going on “tours of shame” of the different war profiteers in downtown SF (and supporting the direct actions, which will be ongoing throughout the day). Come to the next March 19th working group meeting. This is a meeting for folks who are interested in planning the action, coordinating the snake marches, and helping out with other logistical needs. If you decide to plan an action, contact Adrian (adrianw [at] riseup.net) and tell him where and when your action will take place (so that he can let you know if someone else is planning on doing an action at that same location); anything you tell him will be strictly confidential. Occupy their office by handcuffing yourselves to desks or doorways. Do a sit-in or die-in in their office. Do creative and attention-grabbing street theater outside, educating people about what that company is doing (we can help you do research on the company). Hang a banner from their building (again, we can help you out with that). Try to get into the company’s office and do a creative action (present a mock award, deliver a coffin, hold an impromptu ‘dance party for peace’…). Or, you could do an action that isn’t specific to any single location – like altering billboards, or forming a roving bike brigade that pelts corporate offices with rotten vegetables, or anything else you can come up with! Basically, we would encourage you to be creative, come up with an anti-war action that excites you and your group, and then do it! And if you belong to a smaller group, you could always get together with other groups and do an action together. And, of course, we’re here to support you in any way we can. Email us at dasw.march19th [at] gmail.com if you need any specific support, or have any questions. The Export-Import Bank – an arm of the U.S. government – has been heavily involved in Iraqi reconstruction contracts. Even after a large draw-down under Prime Minister Brown, Britain still has about 4500 troops in Iraq. Citigroup is KBR’s banker. KBR is the largest recipient of Iraq contracts. The Carlyle Group has been the leading private equity investor in military industries for more than a decade. Through the International Tax & Investment Center, Chevron has lobbied for the passage of the Iraqi Oil Law and the privatization of Iraq’s oil resources. Chevron execs also met with the Iraqi National Congress in 2002 to divide up Iraq’s oil reserves. Parsons had $5.87 billion in Iraq contracts. AT&T had at least $1.12 billion in U.S. military revenues during 2004-7. In 2006, whistleblower Mark Klein alleged that in Room 641A of AT&T’s 611 Folsom facility, the NSAoperated an intercept facility, to monitor all data crossing the Internet. BAH had $7.75 billion in U.S. military contracts 2003-2006, making it the 17th biggest U.S. military contractor. Goldman Sachs is a major underwriter for KBR, the former Halliburton subsidiary that is the biggest Iraq contractor. Goldman Sachs contributed $390,600 to Bush’s campaign in 2004 (5th biggest contributor). Morgan Stanley is a major underwriter for URS, the 2nd biggest Iraq contractor (see above). Morgan Stanley contributed $600,480 to Bush’s campaign in 2004 (biggest contributor). Blum Capital Partners owns 23.7% of URS Corp. (see above). Its owner, Richard Blum, is married to Dianne Feinstein; Blum sits on the board of URS and Perini, both of which have major contracts in Iraq. Credit Suisse is a major underwriter for Kellogg Brown & Root, the former Halliburton subsidiary that is the biggest Iraq contractor. Credit Suisse contributed $331,040 to Bush’s campaign in 2004 (7th biggest contributor). NBC’s parent corporation, General Electric, had $14.6 billion in total military revenues during 2003-2006 (10th biggest U.S. military contractor), and $8.5 million in Iraq contracts during 2003-2006. Fox News blatantly advocated for the Iraq War, and essentially served as a propaganda mouthpiece for the Bush Administration. March & Rally to End the War Now! STOP U.S. INTERVENTION IN IRAN, VENEZUELA, CUBA, PHILIPPINES . . .
March 19, 2008 will mark the fifth anniversary of the illegal, unjust and disastrous invasion of Iraq by the U.S. military. On March 19, 2003, as the bombing began, thousands of people joined a night march through the streets of San Francisco. On March 19, 2008, a day of resistance will culminate with an evening march from the Civic Center through a number of communities. We urge you to join the march and to help organize for it in your school, workplace, union, community or religious organization. Call the ANSWER Coalition at 415-821-6545 if you can help. The Iraq war is the second longest in U.S. history. It has killed more than one million Iraqis and 4,000 U.S. troops. Hundreds of thousands more have been wounded. Nearly five million Iraqis have been made refugees by the war and occupation. Over a quarter of Iraq’s population has been killed, wounded or displaced. While Bush and the other hypocritical politicians talk endlessly about “supporting the troops,” tens of thousands of returning soldiers have life-altering wounds – both physical and psychological – and totally inadequate medical care and benefits. Many are already homeless. The cost of the war is now running at more than $400 million per day, nearly $5,000 per second. Military-industrial corporations and the big banks are reaping huge profits, while millions of people go without healthcare, decent housing and jobs. Much of the country’s infrastructure – bridges, roads, water systems, schools, etc. — is falling apart. The same banks that are evicting millions of people from their homes are profiting from the war. The vast majority of people want the war ended and ended now. And while some of the presidential candidates talk about ending the war, none of the leading Democratic or Republican candidates have any intention of getting out Iraq anytime soon. The US political and military establishment, not just the neo-conservatives, is committed to dominating the Middle East and incorporating the region as part of a new US Empire. That is why both parties and the Pentagon brass compete with each other to see who can be most threatening toward the people of Iran, Syria, Lebanon, and Palestine. New US wars and conflicts in the region are looming while more than 150,000 soldiers and marines continue to occupy Iraq. The only thing that will stop the war machine is when the people of this country rise up. This is a war for Empire but it not our empire. The owners of Citibank, Exxon/Mobil, Chevron, Halliburton, Bechtel, Lockheed, Boeing, Ford and General Motors and the other corporate elites will profit from the Empire but it is not their sons and daughters who are sent to kill and be killed. VOLUNTEER NOW! Call 415-821-6545 or for the East Bay, call 510-435-0844.
cosponsored by Greenaction, West County Toxics Coalition, Amazon Watch, Richmond Progressive Alliance, Richmond Greens, Community Health Initiative, Communities for a Better Environment, Global Exchange, and Rainforest Action Network. IMPORTANT INFO: Print DASW’s Map (PDF) and Orientation Sheet (PDF) for March 15! 1. Get together with a group of your friends, and help blockade the refinery (please check in with the Chevron working group if you want to do this – their email address is dasw.chevron [at] gmail.com). 2. To get involved in with the bike brigade, contact Bria at brihannala [at] gmail.com. 3. If you have a boat, you can join the ‘DASW Yacht Club! If you’re interested in this, please contact dasw.chevron [at] gmail.com. 4. If these options don’t sound appealing to you, there are many, many other important roles you can play in this action. Please come to the next Chevron organizing meeting (check back for details). 5. If helping organize this action isn’t something you have time for, you can just show up at Carroll Park (W. Cutting Blvd. and S. Garrard Blvd. in Richmond) on March 15th, at 11am. And please tell your friends! Another reason to come out on March 15! The Iraqi government is inviting major oil multinationals to participate for the first time in the development of the oil industry, without waiting for the passage of crucial but controversial hydrocarbons legislation. In a sign that the oil law the US has been pressing for is unlikely to be agreed by parliament any time soon, Hussain Shahristani, Iraq’s oil minister, said in an interview with the Financial Times that Iraq was now determined to push ahead with plans to raise production from a current 2.5m barrels per day to 6m bpd in five years. Speaking on the sidelines of a conference in London, he said major companies were registering to pre-qualify for oil development licences before the February 18 deadline. The process, he said, should lead next year to the award of the first contracts to develop oil fields across the country. Oil giants, so far deterred from Iraq by violence and the absence of clear legislation, are showing keen interest in the pre-qualification process. It marks the first opportunity to tap into a country with the world’s third largest proved oil reserves and a largely undeveloped oil industry with low production costs. While eyeing more long-term relationships with Iraq, major companies are negotiating technical support contracts to get their foot in the door and help raise production of several oil fields by 500,000 bpd this year. These deals do not involve putting teams on the ground and are confined to offering arms-length technical and managerial assistance. The companies include Royal Dutch Shell and BP as well as US giants ExxonMobil and Chevron. The exact terms of the longer-term development contracts have not been decided yet, according to Mr Shahristani. The minister said a “model contract” would be worked out, compensating companies for bringing in technology and financial resources while guaranteeing full government ownership and control of oil. One senior western oil executive said the exact nature of the contract was not necessarily controversial. “I don’t mind as long as you get part of the upside,” he said. Mr Shahristani’s decision to bypass an oil law reflects the government’s frustration with the Kurdish regional government, which has been seeking more independence on oil policy, fuelling a protracted dispute with other parliamentary groups. The Iraqi cabinet approved the oil law a year ago but has since been unable to pass it through parliament, partly due to disagreements over the sharing of oil revenues between regions. The government in the Kurdish north, meanwhile, has passed its own oil law and has been signing exploration contracts with western companies, causing anger in the central government. Mr Shahristani has warned that these contracts are illegal and companies involved in the contracts could be blacklisted. The minister denied that the decision to move ahead with development contracts was primarily a tactical move designed to put pressure on the Kurdish bloc, however. Feb 5: Will the Real Peace Candidate Please Stand Up? We are planning creative protests on Tuesday, February 5, the day of the California primary, to demand the Democratic presidential candidates take stronger anti-war positions. As a lead-up action to a city-wide day of direct action on March 19, we will be going to the campaign offices of Hillary Clinton and Barack Obama on Tuesday, and will use humor and strong visuals to call into question the supposed anti-war credentials of these two candidates. We are planning protests on both sides of the Bay on primary day, gathering at U.N. Plaza in San Francisco and Frank Ogawa Plaza in Oakland. With the theme “Will the Real Peace Candidate Please Stand Up?” we will send a strong message to the candidates that they should not take for granted support from the antiwar camp. The women’s peace group Code Pink, which plans actions throughout the day in San Francisco, expects to meet up with us at U.N. Plaza for a brief march. Come and invite your friends! We also invite you to bring your own visual props, as well as noisemakers, pots & pans, sidewalk chalk, etc. We’d also like to invite you to wear either business drag, or red white & blue attire. And finally, we’d like you to bring whatever you’d like to bring to make this a more festive, fun, and powerful action. Hillary Clinton still refuses to acknowledge that her vote to authorize war with Iraq in 2002 was wrong. She has said that the troop surge is working, and gave it a standing ovation during the State of the Union Address. She voted for a resolution threatening military action against Iran. Barack Obama wants to end the war in Iraq only to escalate it in Afghanistan and attack Pakistan. He also recently wrote a letter justifying Israel’s refusal to allow fuel, food and medicine into Gaza, where people are literally starving and freezing to death. Comments : Comments Off on Feb 5: Will the Real Peace Candidate Please Stand Up? Marches to multiple sites of direct action targeting war profiteers departing throughout the morning from Market and Sansome – led by the Brass Liberation Orchestra! Bikes Not Bombs: Bikers will be leaving Justin Herman Plaza at 7:30, 9:00 and 11:00am to support the day’s actions. 11:00am Words Against War, Market at Montgomery. City Lights Bookstore co-sponsors an anti-war read-out featuring Jack Hirschman, SF Poet Laureate; Guillermo Gómez-Peña, performance artist; Rebecca Solnit, author and activist; and MC James Kass of Youth Speaks. Nonviolent Direct Action and Know Your Rights Training on Tuesday, March 18, 6:30-9:00 p.m. at CellSpace, 2050 Bryant (near 18th), San Francisco. 1. Get together with a group of your friends, and plan a direct action against a government or corporate office on March 19th. 2. If doing a direct action isn’t your cup of tea, there are many, many other vital roles you can play in this action. Please come to our next organizing meeting and plug in. 3. If helping organize this action isn’t something you have time for, we’re asking that you take the day off work or school on March 19th, and meet up with us at Market & Sansome starting at 7:30am. 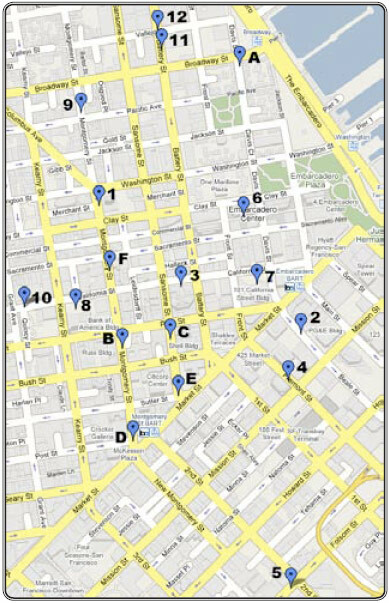 Snake marches will be leaving Market & Sansome throughout the day, and going on “tours of shame” of the different war profiteers in downtown SF (and supporting the direct actions, which will be ongoing throughout the day). Please come out, and invite your friends! 4. Come to the next March 19th working group meeting. This is a meeting for folks who are interested in planning the action, coordinating the snake marches, and helping out with other logistical needs. If you decide to plan an action at a corporate or government office, we’d encourage you to come to the DASW general organizing meeting on March 2nd and announce what action you’re planning on doing. But if you don’t feel comfortable announcing your action at our meeting, please contact Adrian (adrianw [at] riseup.net) and tell him where and when your action will take place (so that he can let you know if someone else is planning on doing an action at that same location); anything you tell him will be strictly confidential. • Occupy their office by handcuffing yourselves to desks or doorways. • Do a sit-in or die-in in their office. • Do creative and attention-grabbing street theater outside, educating people about what that company is doing (we can help you do research on the company). • Hang a banner from their building (again, we can help you out with that). • Try to get into the company’s office and do a creative action (present a mock award, deliver a coffin, hold an impromptu ‘dance party for peace’…). The Iraq war needs to end. The majority of the American public and global community opposes this senseless conflict. It is up to us to actively confront the political and economic interests behind the war, and demand an immediate and unconditional end to the war in Iraq. On March 19, 2008, it will have been five years since the U.S. invasion of Iraq. Five years in which opposition has grown amongst the people that this war is supposedly being fought for. Polls by Zogby and the Univ. of Maryland in 2006 found that 74% of Iraqi Shias, 91% of Sunnis, and 72% of U.S. troops in Iraq wanted the U.S. to withdraw within the next year. And a December 2007 poll by NBC found that 57% of Americans want the U.S. to withdraw from Iraq by early 2009. And yet, the killing goes on. A Johns Hopkins study found that violence claimed the lives of over 600,000 Iraqis between 2003 and 2006 – almost as many people as live in San Francisco. But it’s not just Iraq that’s being torn apart by the U.S. war machine. According to data from the U.S. OMB, our government has spent over $2.8 trillion on the military since 2003 – and this uncontrolled spending has crippled our society. March 19, 2008, provides us with a key opportunity to think about what we would do with $2.8 trillion – for example, provide universal health care, rebuild schools in disadvantaged communities, or build new houses for the New Orleans residents displaced by Katrina. But our government, ignoring our protests against massive cuts to social programs, instead pours money into empire-building – into expanding its military, political, and economic power over the people of the world. Our government is attacking Iraq, and at the same time is fighting a war against poor people and communities of color, both in America and throughout the world. These two wars are in fact one and the same, and each of them fuels the other. We must put an end to both. However, the warmakers that run this country have refused to listen to us. Permitted street marches and electoral campaigns alone cannot bring this war to an end. It is up to us to organize nonviolent direct actions that will send a clear message to the economic and political interests behind this war: We will actively confront you every step of the way until the U.S. withdraws its troops from Iraq. Direct Action to Stop the War is a decentralized, unaffiliated network of Bay Area affinity groups and individuals. As we did five years ago, we are again taking direct action against warmakers in the Bay Area. However, unlike five years ago, we are now in a situation in which the occupation of Iraq has proven to be a disaster, many Iraqis are resisting the occupation, and U.S. troops and the American people are increasingly rejecting the war. As never before, we have the power to end the war in Iraq. We are asking you to join us at our next organizing meeting, and help plan a city-wide day of coordinated, decentralized, and nonviolent direct actions on March 19, against government warmakers and corporate war profiteers in downtown San Francisco. We hope that you will join or create an affinity group, and plan your own direct action against a government, military, or corporate target. And if you want to help out but don’t want to be arrested, please come to our organizing meetings and help us organize, or just show up at Market & Sansome on March 19. Direct Action to Stop the War is also working to broaden the radical anti-war movement, by building connections with other movements for social justice, people’s power, and environmental sustainability. Together with Green Action and the West County Toxics Coalition, we will be targeting the Chevron refinery in Richmond on March 15. We are taking action against Chevron to emphasize that company’s complicity in creating an Iraq Oil Law that economically exploits the Iraqi people. We are also standing alongside environmental justice movements that struggle against the industrial poisoning of American communities of color. Direct Action to Stop the War will also be targeting Democratic and Republican presidential candidates and politicians on February 5 – and drawing attention to the complicity of both political parties in funding this endless war on the Iraqi people. Join us, and help build an inclusive, anti-authoritarian network that welcomes anyone and everyone opposed to endless militarism and war. meet at frank ogawa plaza in oakland and un plaza in s.f. What is an affinity group?